Our heroine, who I think the writers have finally agreed to called Suzanne, was hospitalized after having a close encounter with the fiery demon Loki and the irate amazon Emu. Suzanne is spirited away to Valhalla by the All-Father Odin just seconds before Agents Scully and Mulder show up, claiming they need to question her about the terrorist attack that destroyed her car. In Valhalla, we learn that Odin has chosen Suzanne to receive the titular Power Of The Valkyrie and chosen Thor to train her. Thor is less than pleased about this because his lady love Emu was supposed to get said power. He is even less pleased after Emu attacks him and takes his power. While that's going on, Suzanne is presented to "The Creature Pegasus", who immediately takes a shine to her - a sign she is meant to be the Valkyrie, according to Odin. When a messenger brings word that Loki has been sighted nearby, Suzanne hops on Pegasus to ride off and look for trouble over Odin's objections. She kills a demon in mid-flight, Pegasus keeps losing and regaining his wings between panels and the comic ends as Suzanne decides to explore a mysterious dark castle and is ambushed by Emu. Confused? Read Parts One and Part Two. It won't help in the least but it may be amusing. 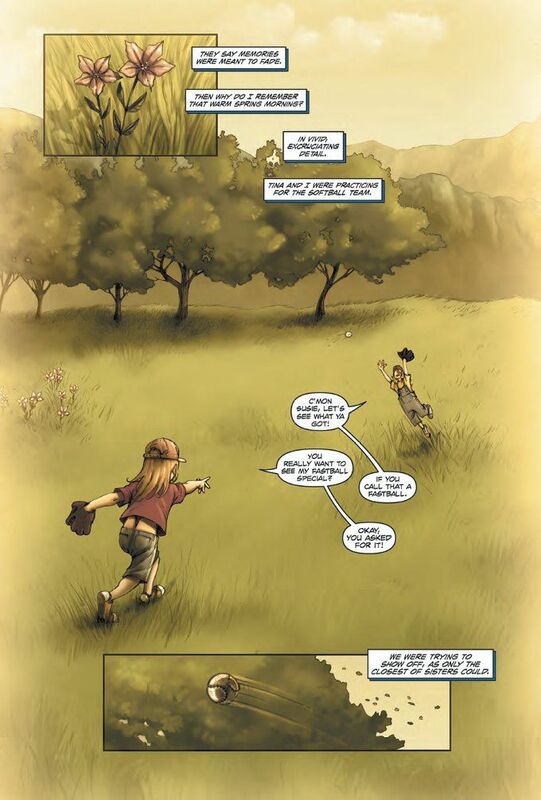 Part Three opens with... a flashback to Suzanne's childhood? Yes - halfway through our story and we're just NOW getting our first glimpse into our heroine's past and the first sliver of a motivation for what she does and who she is. Her sister got hit by a car chasing after a ball Suzanne threw into the street, the incident made Suzanne want to become a nurse so she could heal people and she remembers the incident every time she sees blood. You'd think this would have come up at some point when she was going through nursing school but if I start picking apart everything about this comic that doesn't make sense, we'll be here all night. Suzanne is stirred from her flashback by someone saying her name. She repeats it and and Emu asks if that is her name. It's a fair question given the lax continuity so far, but shockingly her name remains Suzanne for the moment. 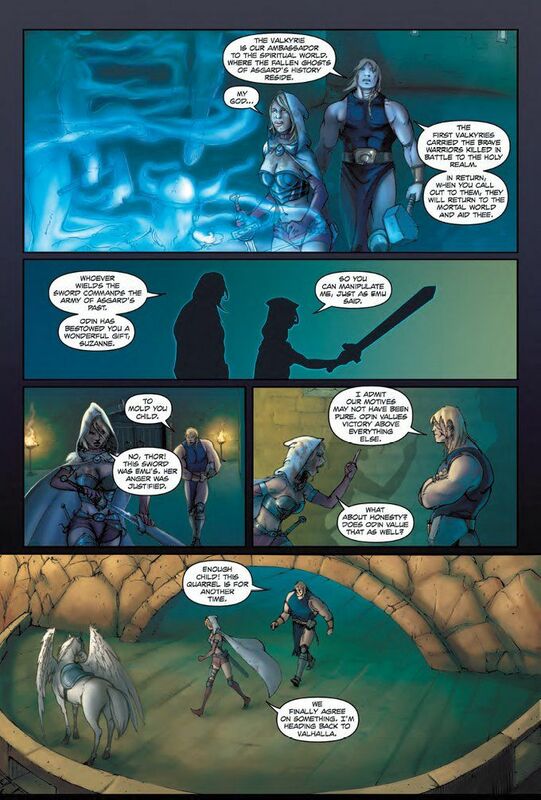 Yet this comic finds new ways to disappoint us, with Thor's dialogue balloons being jacked up. 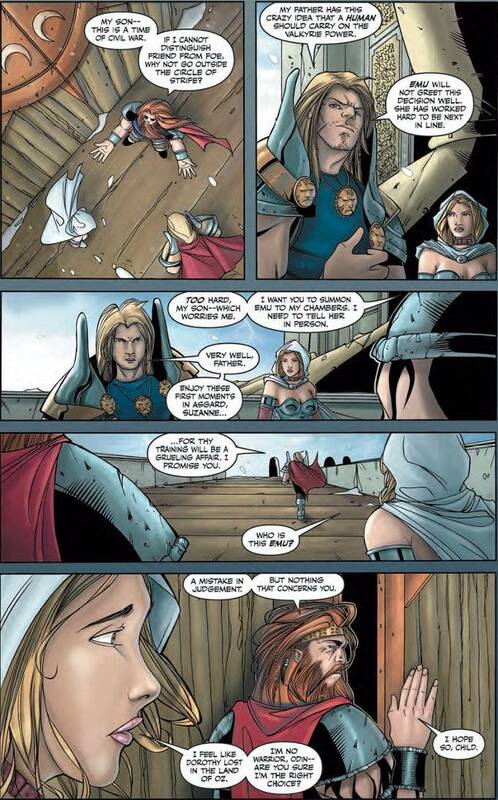 Either they messed up the word balloons or Thor is practicing his ventriloquism. Suzanne picks up the sword and gets ready to fight Emu. 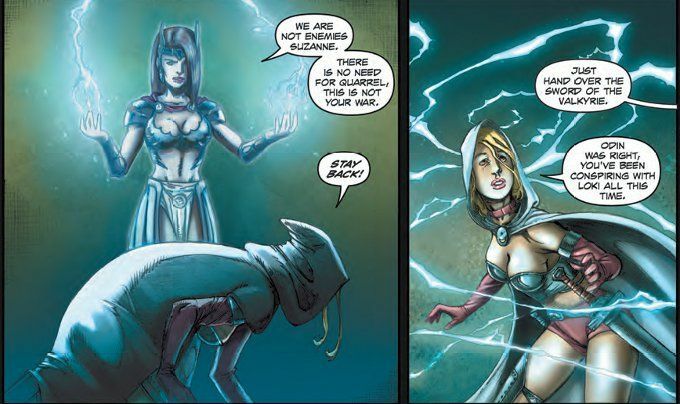 It is then that Suzanne discovers why it is a bad idea to attack someone who commands the power of lightning with a metal object. Even if it is a magic metal object. Actually, Odin never said a thing about Emu conspiring with Loki to Suzanne last issue. In fact, it was pretty clear Odin had no idea Emu was conspiring with Loki. Why? Well, she was still at liberty in Valhalla when he returned with Suzanne. Also, he sent Thor to go find Emu so he could tell her of his decision regarding who would get the Power of The Valkyrie. 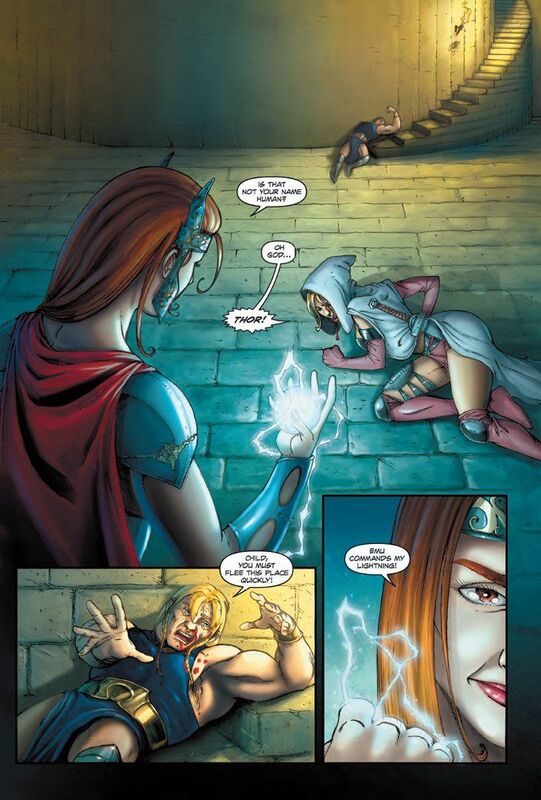 Thankfully, Thor is there to save Suzanne from becoming a scantily clad lightning rod. He tells Suzanne what the TRUE Power of The Valkyrie is - raising the dead! Suddenly, Suzanne starts hearing voices begging to be cut loose and she does so. 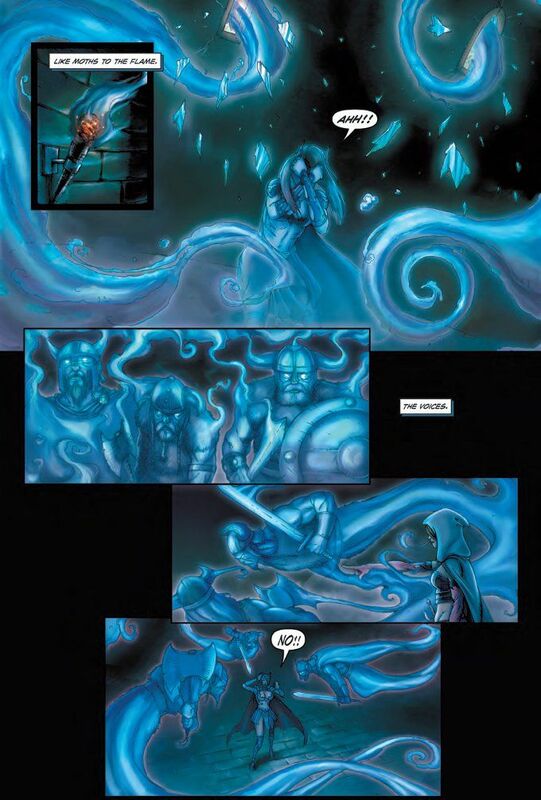 A horde of ghostly vikings show up and all the torches in the room go out. In the midst of this chaos, Suzanne goes berserk. Emu pleads for mercy, saying the was only trying to save Suzanne from corruption at the hands of a power humans are not meant for. Suzanne impales her on the sword and Emu dies, muttering that Suzanne is now doomed to become Odin's pawn in the never-ending war with Loki. Thor, who seems remarkably calm considering he just saw his girlfriend die, explains The Power of The Valkyrie and the role of the Valkyrie in Asgard's army. He also confirms that what Emu said about Suzanne being a pawn in the battle to come... even though he had no idea what Odin's motivations in asking him to train Suzanne were last issue. That's a rather big plot hole. So is Thor's speaking of the role of The Valkyrie in the singular as if it were a title then going on to speak of multiple valkyries and how they gathered the souls of dead warriors. And how could Odin have meant to give Suzanne the power when their meeting was a random accident in the first issue and he'd have had no way of knowing of Emu's plotting with Loki at that point in the story? Suzanne, showing the same even-temper and foresight we've seen throughout this series, gets royally pissed about the idea of being manipulated and forced to serve in a fight that is not hers. 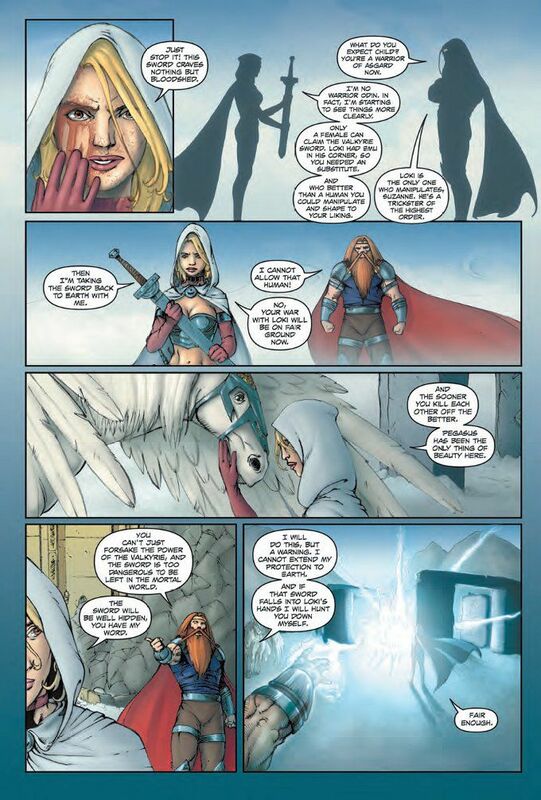 She ditches Thor, flies back to Valhalla and tells Odin she doesn't need his civil war. 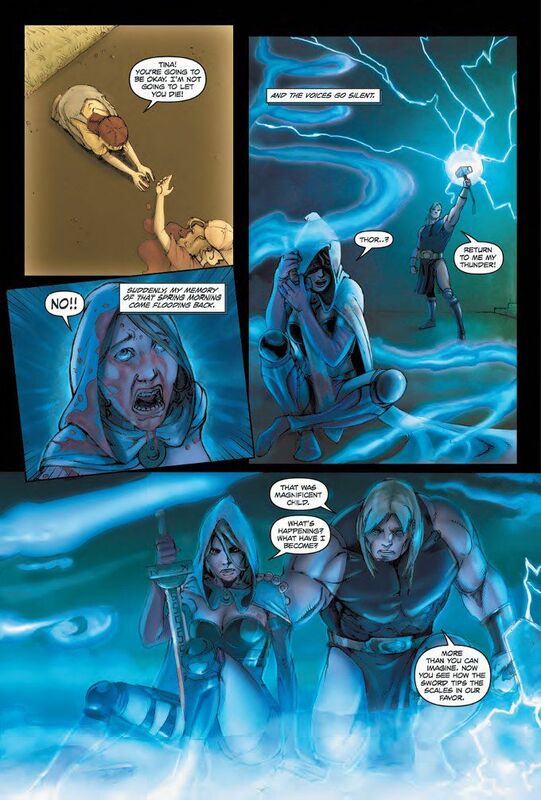 She also goes from being soaked in blood to squeaky clean in the span of two panels as she gives Odin a bargain - let her go back to Earth and she'll hide the sword where no one can find it. ... wait a minute! 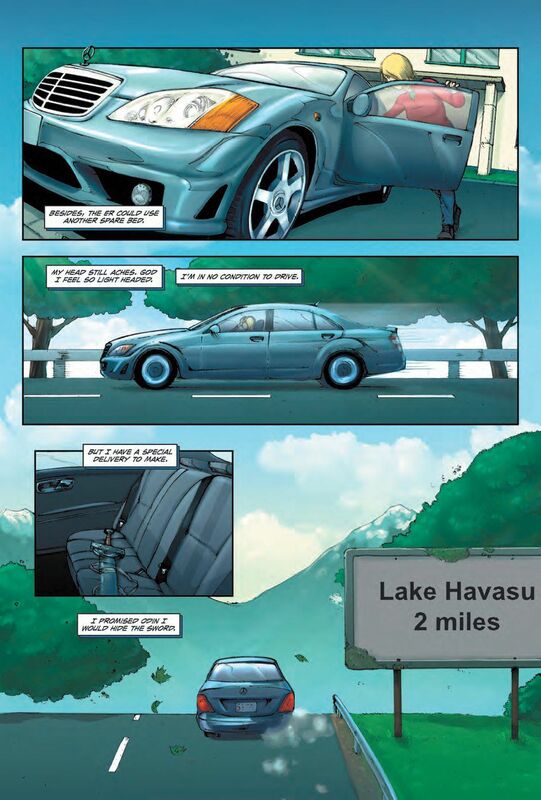 Her car was destroyed back in the first issue! And her car was a red two-door sports car with a personalized plate that said SUZY - not a bluie four-door! Does she have two cars? How? Nurses don't make that much! Is she renting a car? Borrowing it from a friend? These are perfectly valid questions, comic! Answer me! 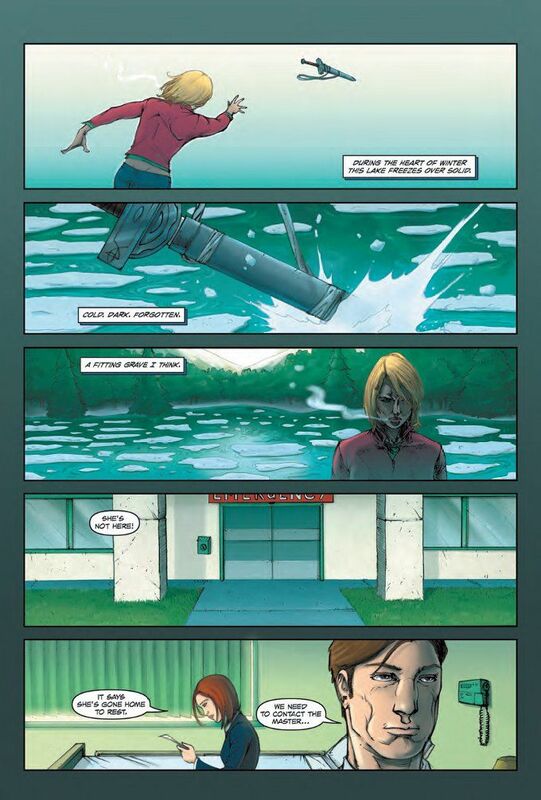 *sighs* Anyway, Suzanne drives out to some lake, where she throws the sword into the water. 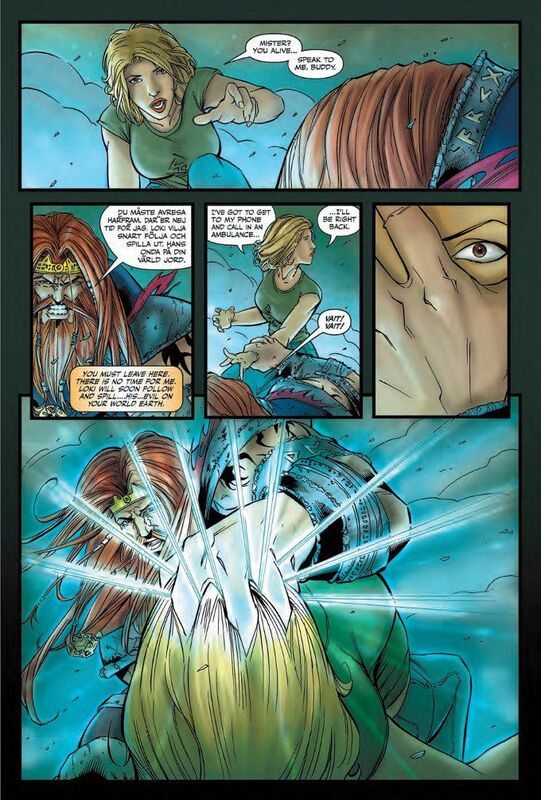 Yes, this comic has already savaged Greek, Norse and Abrahamic myth. Let's mix in some Arthurian Legend while we're at it! Let no fandom remain unpissed! Speaking of pissed-off fandoms, we finally get an explanation for why Mulder and Scully having been hunting for Suzanne. The good news is that this comic isn't about to become some horrible X-Files tie-in comic. 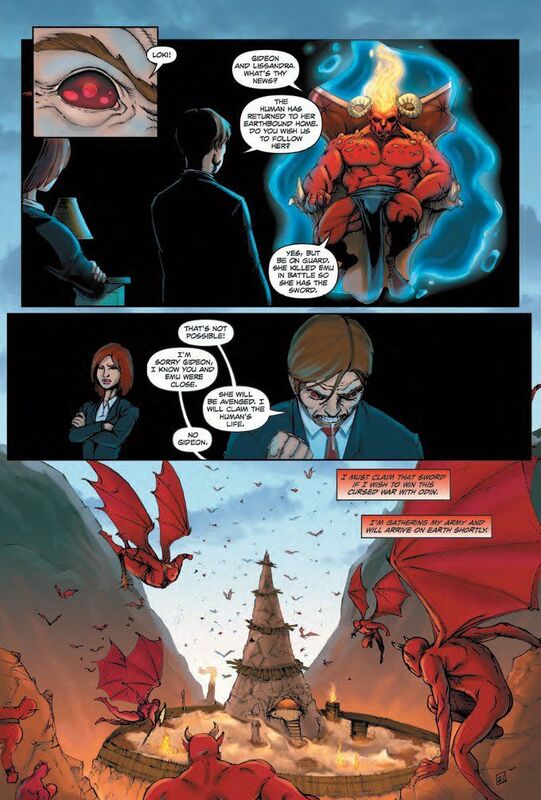 The bad news is that they are shape-shifting demons in Loki's employ. We never do find out how Suzanne managed to get past them when they were supposed to be watching the hospital but we do find out that Loki is somehow aware that the sword is now on Earth and that he will be arriving shortly with his armies to retrieve it. One issue left, kids! Can you take it?